What determines a successful performance in free improvisation? Is it the level of empathy in the musician-musician relationship? The untraversed deposits of synergy resulting from the collective fusion of musicians improvising within a limited number of participants? Or maybe it is the musician’s craft itself, because when you are capable of playing anything, you can only play what you wish. 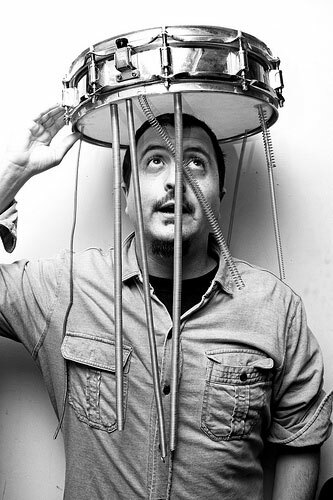 What determines such a performance in the case of the Portuguese/Catalan drummer, percussionist and improviser, Vasco Trilla? In this case, the key attributes of success seem to consist of the three factors – firstly- imagination, secondly – transgenre experiences in performing music and finally, thirdly, the diligence! Speaking of the latter vices… In the course of almost three weeks between September and October 2016, Vasco Trilla toured in Poland (Bydgoszcz, Gorzów Wielkopolski, Poznań, Kraków), in Hungary, he appeared on several concerts in Serbia, followed by Bulgaria. In fact, in each of these concerts Vasco performed with different musicians. That is, speaking of … new experiences. The duet with Yedo Gibson, Johannes Nastesjo, or Mikołaj Trzaska. The trio with Susana Santos Silva and Kaja Draksler. The trio with Piotr Mełech and Jacek Mazurkiewicz. The trio with Rafał Mazur and Michał Dymny. Quartet? The one with Ivan Gonzalez, Fernando Carraco and Alex Riveriego. That is only the tip of the iceberg. The experience of the last twenty four months. Solo acts? The Spontaneous Music Tribune on albums The Suspended Step and The Rainbow Serpent: A boiling crucible of ideas, a multitude of experiences not only in the field of improvised music (…), unique musical craft, a wide repertoire of techniques implemented in sound production and a huge… practical knowledge of physics (topic: how the sounds are dispersed), these are the attributes of Trilla, which particular intensity, reach us while listening of his solo albums. As I already mentioned (…) my absolute favorite in the arsenal of Thriller is the ability to multiply vibrations, into which different musical accessories as set by the musician. It is no different at the beginning of the first release. Everything vibrates, sizzles, and even though we operate exclusively acoustically, we receive the sound resembling progressive electronics. It is filled with darkness, murmur and mystery which in a way arises… from the musician’s black-metal experiences. No sound is obvious, and the level of predictability of what is going to happen reaches negative values. In the seventh part of the second album, we have the impression that we can hear… the violin. There is a pinch of melody, a substitute of rhythm, only the specified instrument is missing. The focused narrative that allows us to notice nuances, immerse in the texture of the music, derive a large dose of pleasure from this portion of music. With the drum kit, the musician searches for melody and.. an opportunity to make noise with the help of the increasing number of ideas to create it. The musician himself claims that he is already obsessed with it. Whatever gets into his hands is immediately checked for the sound it produces. Vasco Trilla. The Catalan citizen of the world. He performs and records on every continent. Every day, every hour.